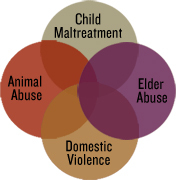 Over the past 30 years, researchers and professionals in a variety of human services and animal welfare disciplines have established significant correlations between animal abuse, child abuse and neglect, domestic violence, elder abuse and other forms of violence. Mistreating animals is no longer seen as an isolated incident that can be ignored: it is often an indicator or predictor crime and a “red flag” warning sign that other family members in the household may not be safe. We call this species-spanning interconnectedness of different forms of violence The Link. The National Link Coalition is a multi-disciplinary, collaborative initiative to increase awareness and address public policy, programs and research. We serve as the National Resource Center on The Link between Animal Abuse and Human Violence. We want to stop the cycle of violence that often affects multiple family members. To achieve this critical goal, we need your help. Visit The National Link Coalition for more information. ~ from the National Link Coalition home page.